Incontinence can be challenging; especially when managed with retail-grade products. Home Delivered was created by our family to provide high-quality adult incontinence products like Prevail. Prevail is the best choice for families looking for affordable incontinence protection without sacrificing quality. Home Delivered ships Prevail products direct to your loved one’s home or assisted living discreetly throughout the continental U.S.
Prevail Protective Underwear comes in a wide range of sizes and styles including male and female designs. Protective underwear pulls on and off like regular underwear. Ventilated waist panels and Quickwick™ reduce the risk of skin irritation. The cloth-like outer fabric and Odor Guard™ make Prevail underwear discreet to wear. Breezers are the ideal adult briefs for maximum plus incontinence protection. Breezers include performance and comfort enhancing features not available in retail brands including Skin Smart™, Odor Guard™, Quickwick™ with MaxiSoft, and easy lock fastener tabs. StretchFit combines effective product performance, increased breathable areas, and hypo-allergenic Skin Smart™ fabric infused with Aloe, Chamomile and Vitamin E to dramatically improve skin wellness. StretchFit Briefs have stretchy side panels that are easy to grab, pull, and attach for an adjustable fit that is secure and comfortable. 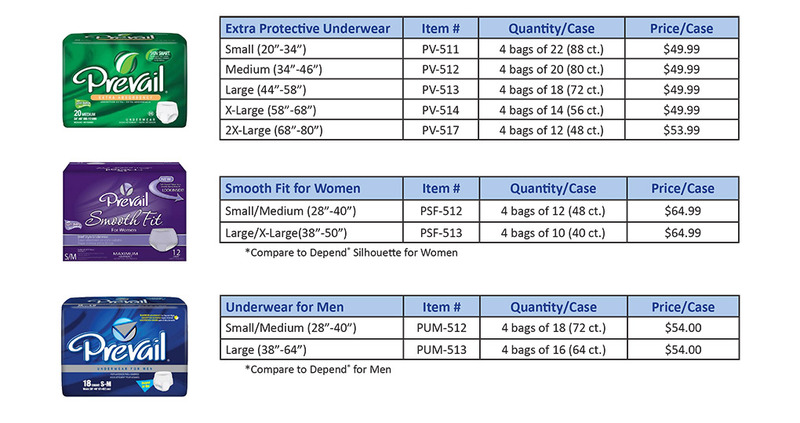 Prevail Specialty Size Briefs are for maximum absorbency and are designed to fit large waists. Bariatric sizes are not readily available in retail stores but can be home delivered in just a few business days. Now with Skin Smart™, Prevail’s super strong and soft washcloths are hypoallergenic and enhanced with lotion for skin wellness. Prevail’s Single-Hand Dispensing is easy to use while dispensing one wipe at a time, adding convenience and reducing waste. Prevail premium underpads are high quality, super absorbent disposable underpads for moderate to heavy incontinence protection. They are designed for protecting beds, chairs, and other surfaces. Prevail underpads feature the Dri-Bed technology with super absorbent polymers that reduce odor and absorb additional fluid.